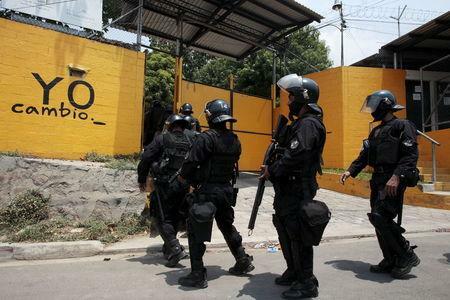 SAN SALVADOR (Reuters) - El Salvador plans to boost prison security and deploy more troops in the streets to battle a rising wave of gang violence that has pushed murder rates to record levels, President Salvador Sanchez Ceren said on Wednesday. The government has declared a state of emergency in seven prisons, limiting gang leaders' movements inside and prohibiting visitors and outside communication for 15 days. Officials also plan to contract a thousand reserve soldiers to reinforce existing troops in controlling chunks of territory taken over by gangs, known as maras. The small, impoverished Central American state ranks among the world's most violent. Murders jumped almost 120 percent in the first two months of this year compared to 2015. "Faced with this irrational violence, we are forced to take urgent measures, of an extraordinary character, in order to guarantee security (and) peace for all Salvadorans," Sanchez Ceren said in a national broadcast. The government also plans to ask Congress to approve 14 measures to increase prison controls, as incarcerated leaders are still able to order killings and extortions. 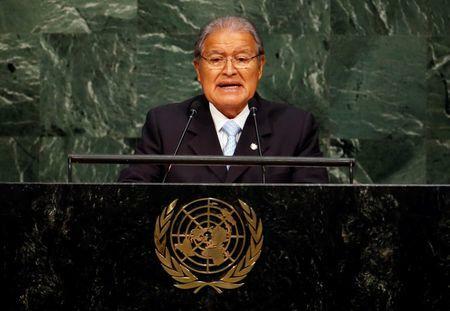 El Salvador this month considered declaring a nationwide state of emergency to combat gang violence, including suspension of some constitutional rights. Spokesmen for the two major gangs, Mara Salvatrucha (MS-13) and its rival Barrio 18, promised to reduce murders if the government halted its plans, but authorities refused. The president also plans to ask legislators for a $1.2-billion loan to reinforce security measures.